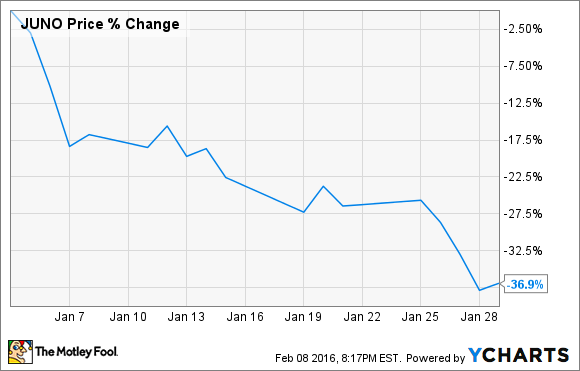 Juno Therapeutics kicked off 2016 by losing over a third of its value. Here's why. What: According to data provided by S&P Global Market Intelligence, Juno Therapeutics (NASDAQ:JUNO), a mid-cap immuno-oncology company, dropped by approximately 37% last month. On the bright side, this dramatic decline wasn't triggered by a company specific event, but rather a marketwide sell-off that took place across the landscape of clinical-stage biotechs. So what: Juno -- along with its closest peers in the chimeric antigen receptor (CAR-T) and high-affinity T-cell receptor technology (TCRs) space such as Kite Pharma (NASDAQ:KITE) -- have proved to be excellent barometers for the market's sentiment toward the biotech industry at large. After reporting encouraging early stage results of its lead product candidate JCAR015 in relapsed/refractory acute lymphoblastic leukemia last year, for instance, Juno initially saw a nice surge in its share price. However, Wall Street's love affair with the biotech quickly faded due to the growing concern that serious adverse events like cytokine release syndrome and neurotoxicity may limit the commercial potential of both Juno and Kite's modified T-cell platforms. Now what: Besides the fact that Juno is on track to potentially reach the commercialization stage of its life cycle by 2017, the biotech also sports a $1 billion development deal with biotech heavyweight Celgene (NASDAQ:CELG). This 10-year partnership deal with Celgene has helped Juno to build a healthy cash position of roughly $1.2 billion at last count -- meaning that it won't be forced to erode shareholder value through dilutive financing measures anytime soon. That's a big plus for any developmental-stage biotech, especially during a period of drastically lower valuations across the board. As such, risk-tolerant investors may want to dig deeper into this intriguing speculative biotech.